Big Bend is in the Chihuahuan Desert. 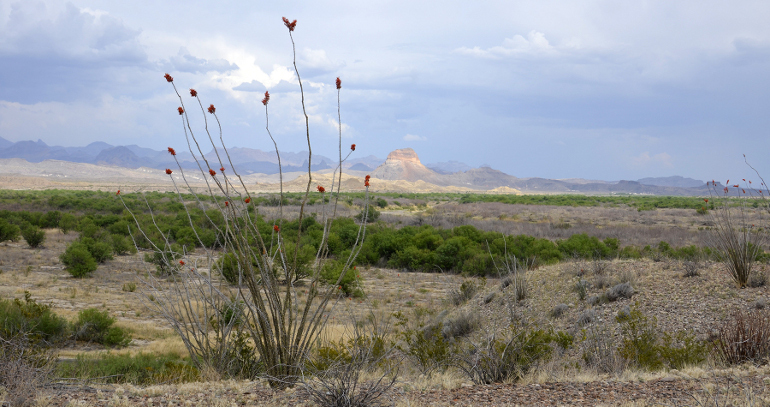 Big Bend is located in the Chihuahuan Desert, one of four major deserts in the United States. It may seem counterintuitive but there are more bird species here than almost anywhere else in the country. This is due to the wide variety of habitats, some of which are not desert-like at all, as well as its location along many migration routes. "Big Bend National Park has national significance as the largest protected area of Chihuahuan Desert topography and ecology in the United States. It is home to about 450 species of birds, more than any other national park in the United States. Thirty-one species of snakes, twenty-two species of lizards, and four species of turtles have been found in Big Bend National Park," and it contains one of the most diverse assemblages of butterflies in the U.S."
Brower, Kenneth. "Big Bend". National Geographic Traveler. Vol. 16, No. 8, p. 106. Nov./Dec., 1999. Texas Bird Records Commitee - Check out their links. Graves, J. "Texas Hill Country." National Geographic. Vol. 195, No. 4, p. 104. April, 1999.